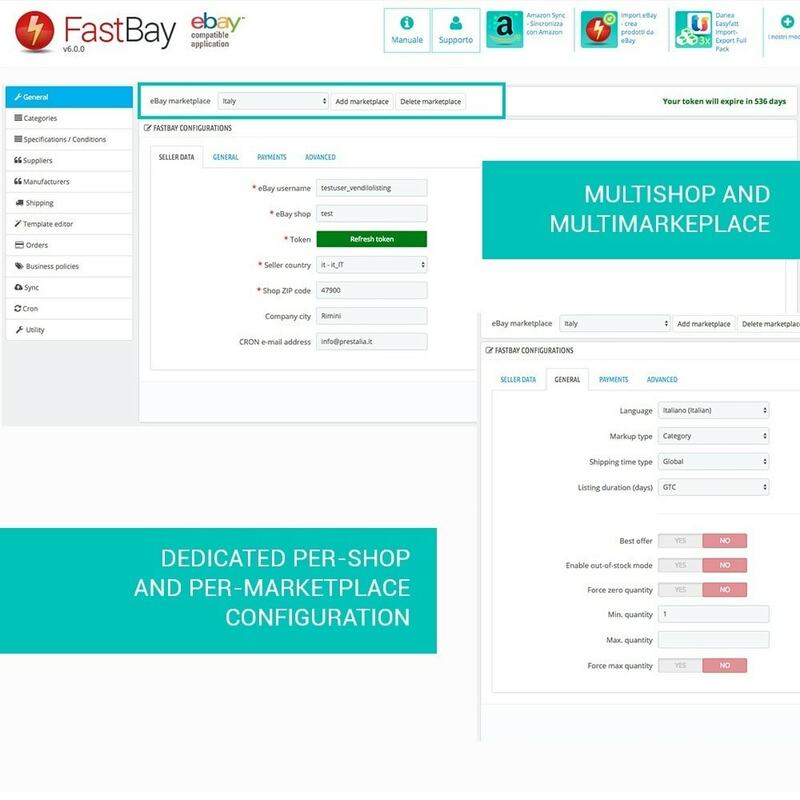 Over 2,400,000 Ebay Listings have been already created with FastBay. 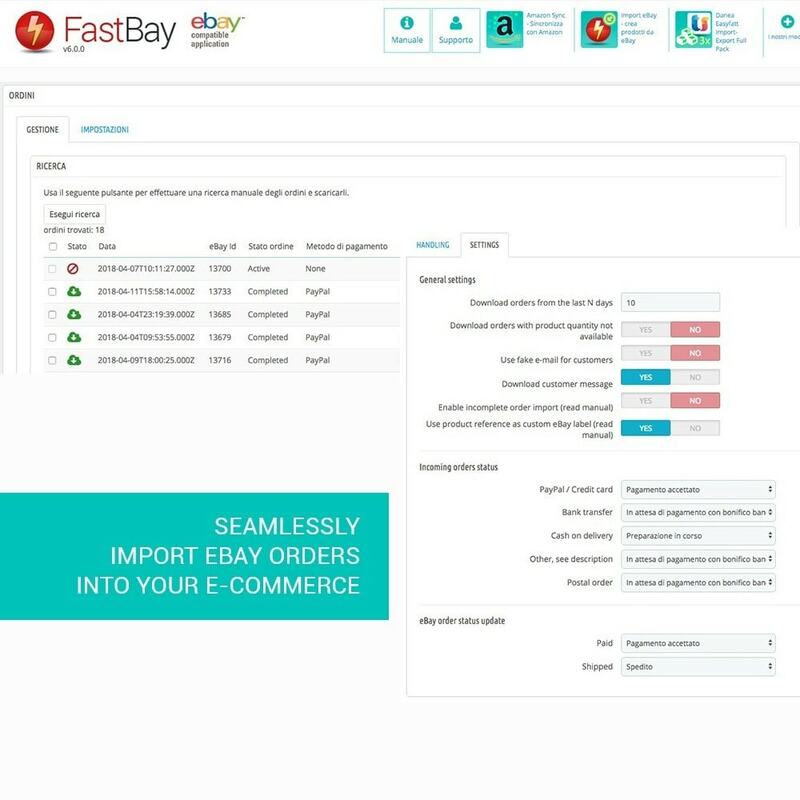 EASY - A simplified configuration wizard will allow you to customize all settings without any problem in order to synchronize and manage products and orders. 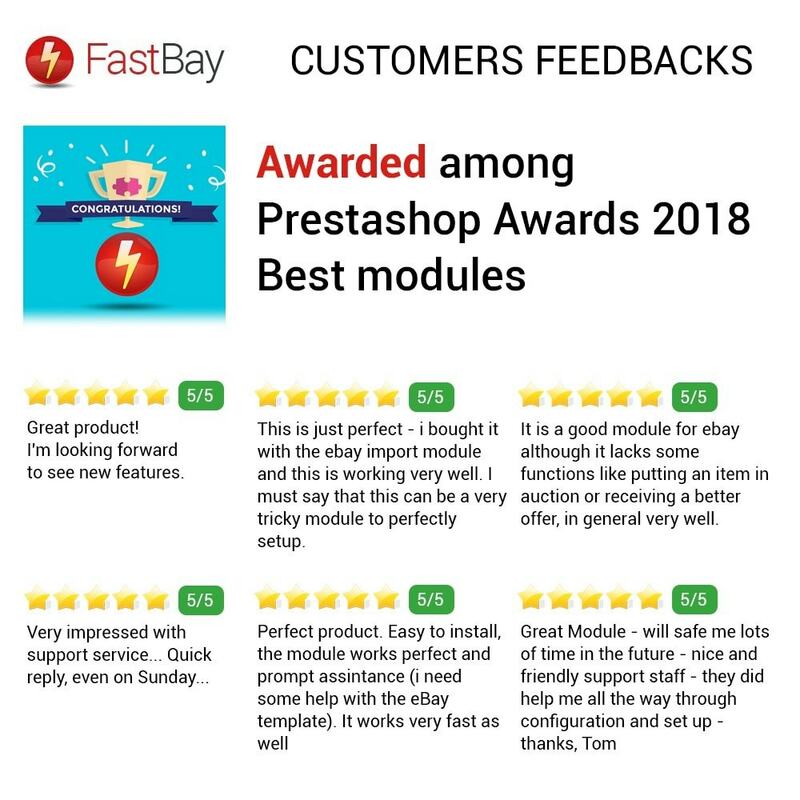 RELIABLE - Our module will assist you in every step of sync process and if you need assistance we guarantee a response within 48 hours. 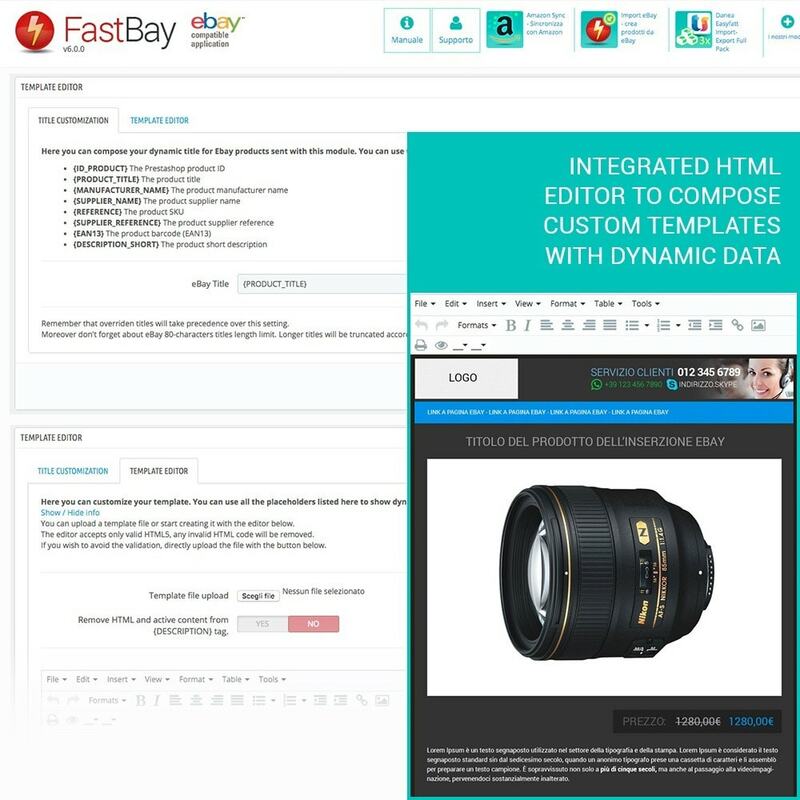 FLEXIBLE - FastBay guarantees many features that allows you to make a flexible site management that will suits all your needs. 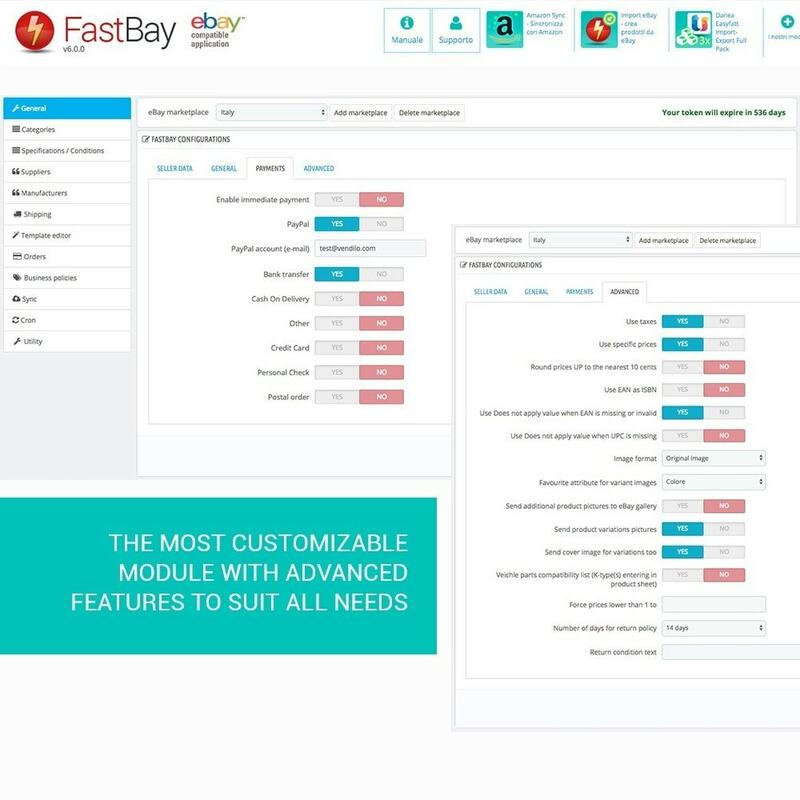 FAST - With our FastBay module your 'waiting times' will be reduced beyond belief ! 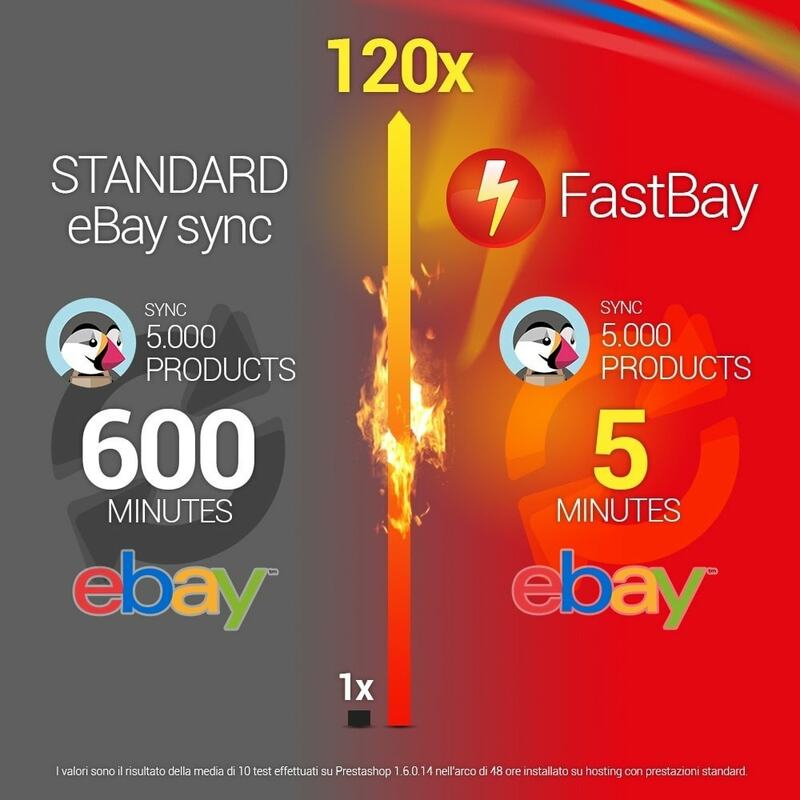 Sync in a couple of minutes more than 5.000 products! 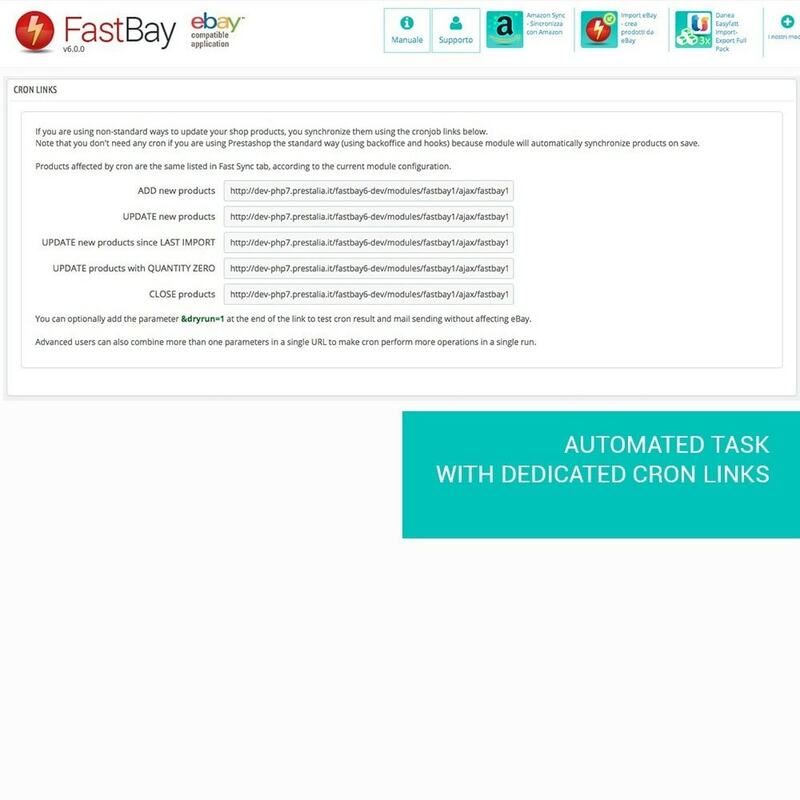 FAST SETUP: Easy configuration steps will permit you to go online in few minutes. 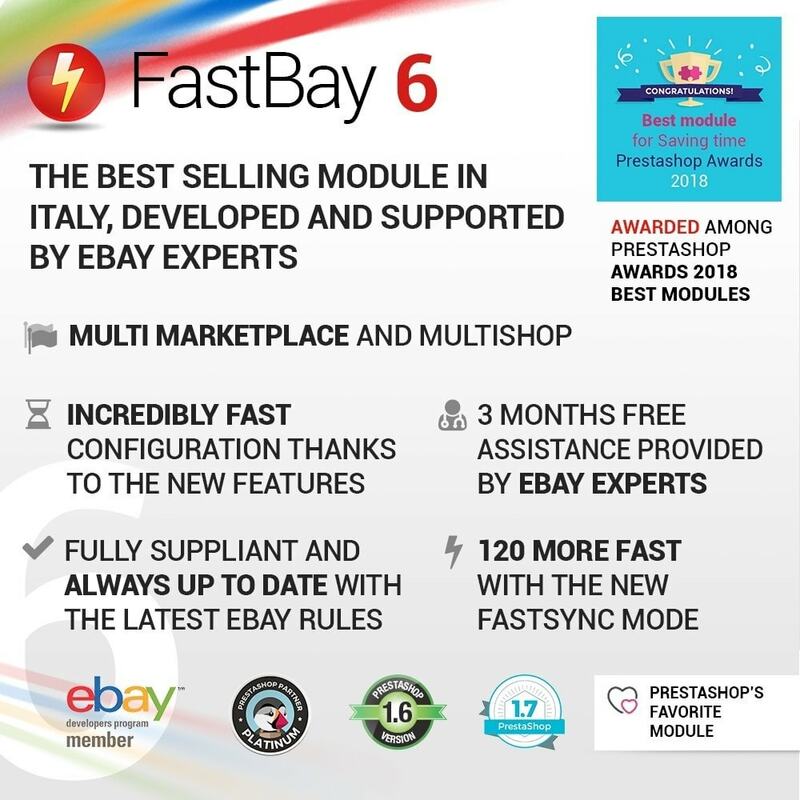 PRESTASHOP CATEGORIES: Linking your Prestashop categories to eBay's categories is easy and fast - You will also have the chance to handle category price surcharges/discounts. 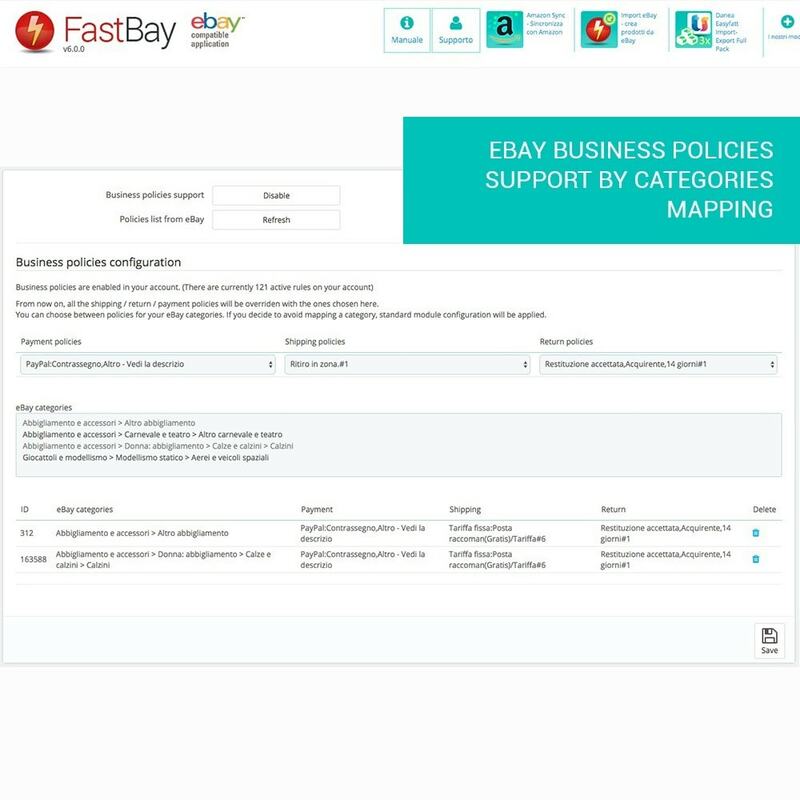 EBAY STORE CATEGORIES: You have the changc to link your Prestashop categories to you custom Ebay Store categories. 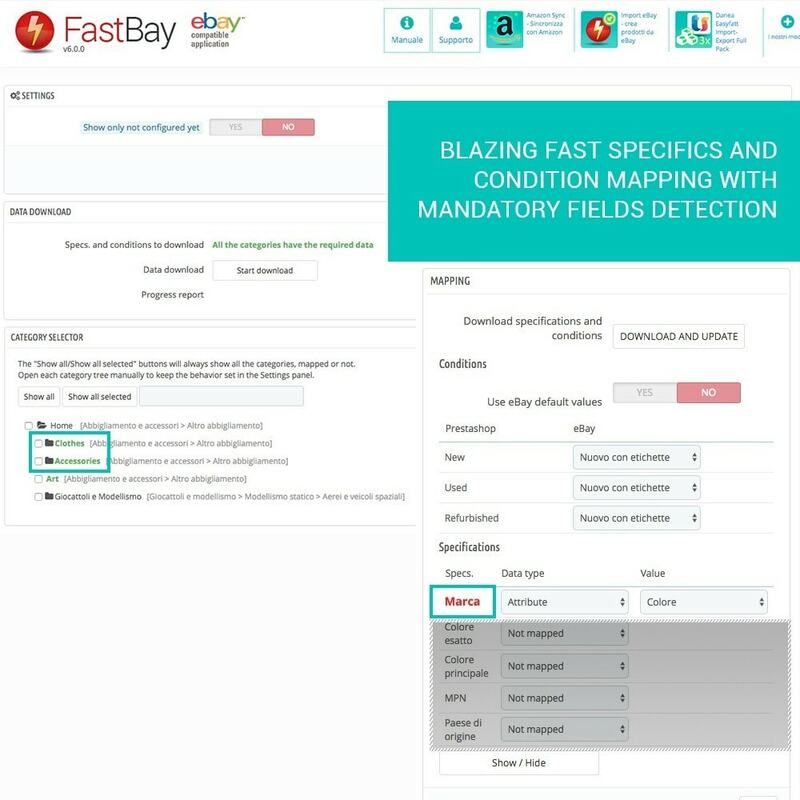 SPECIFICS AND CONDITIONS: Complete management of eBay's specifics / identifiers with the possibility to link attributes, features, manufactures, default eBay's values and many more values. MANIFACTURERS AND SUPPLIERS SURCHARGE: You can handlecustom price surcharges also on suppliers and manufacturers. CUSTOMER CARE: You will have direct support for any problems regarding installation, configuration and troubleshooting. Full control and complete customization of the sync procedure. 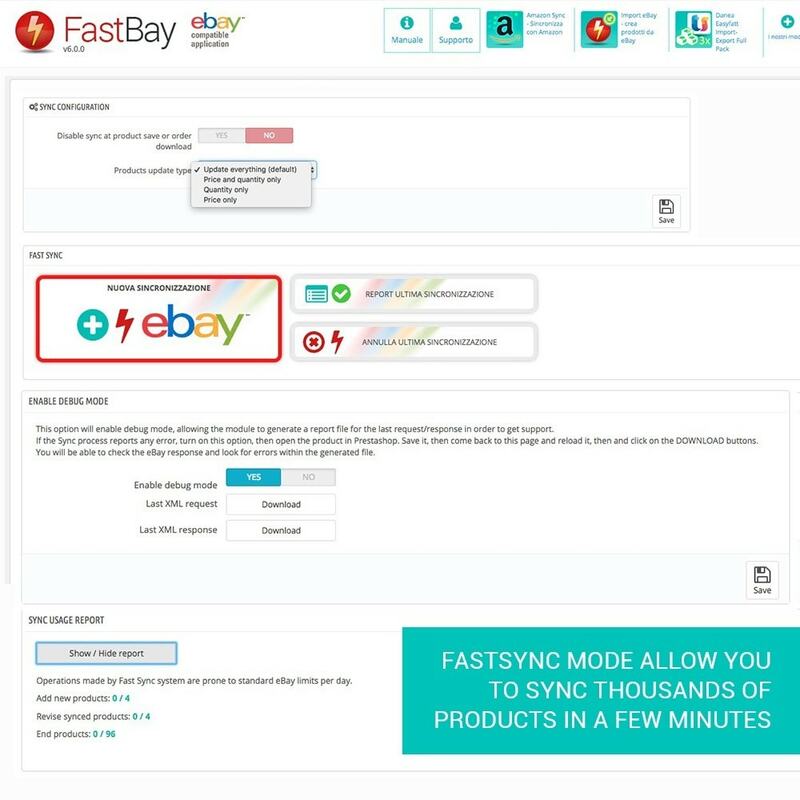 Three synchronization modes, FastSync (120x) will allow you to refresh your catalogue in a couple of minutes. 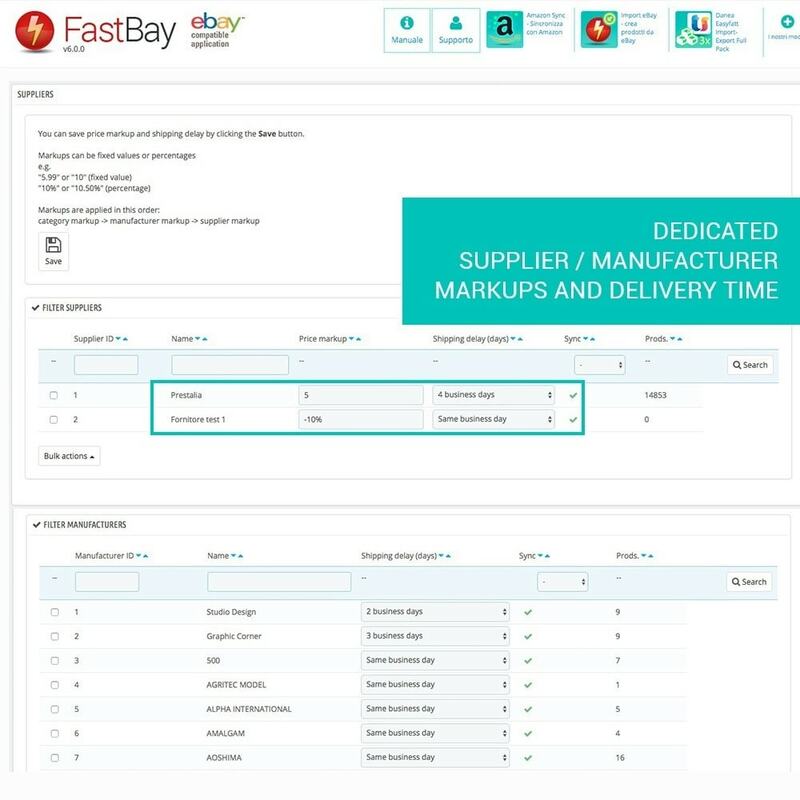 Customized price markups on category, manufacturer and supplier with specific options. 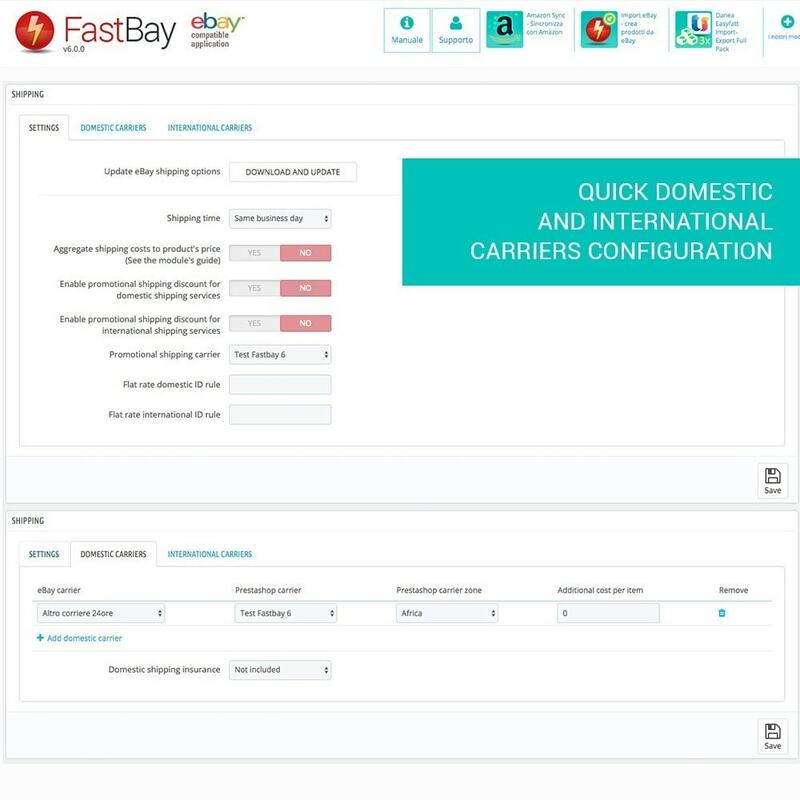 Domestic and international dispatch time handling with dedicated surcharge. 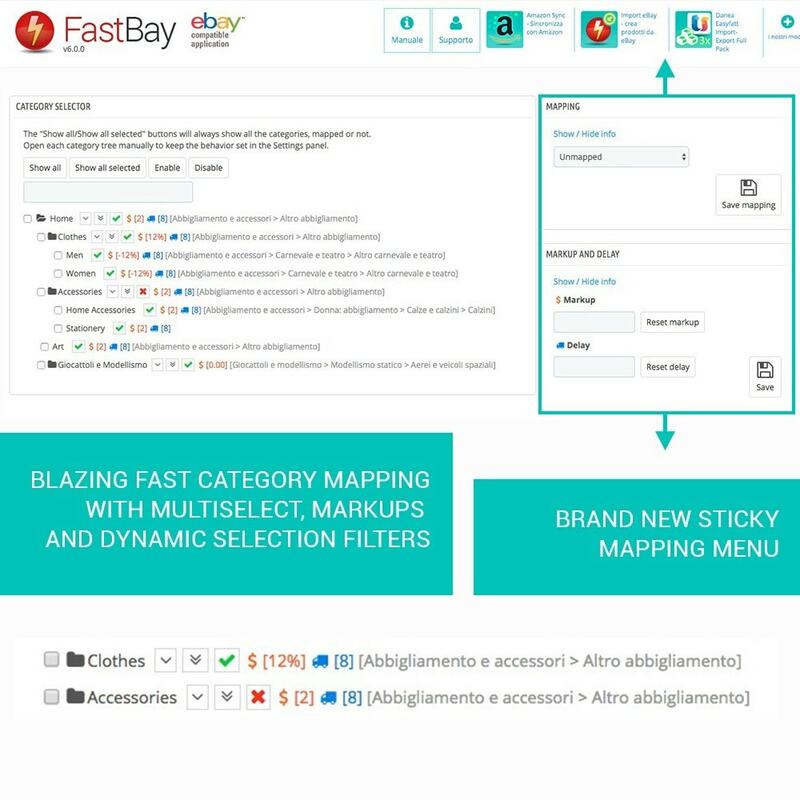 Prestashop to ebay categories mapping. 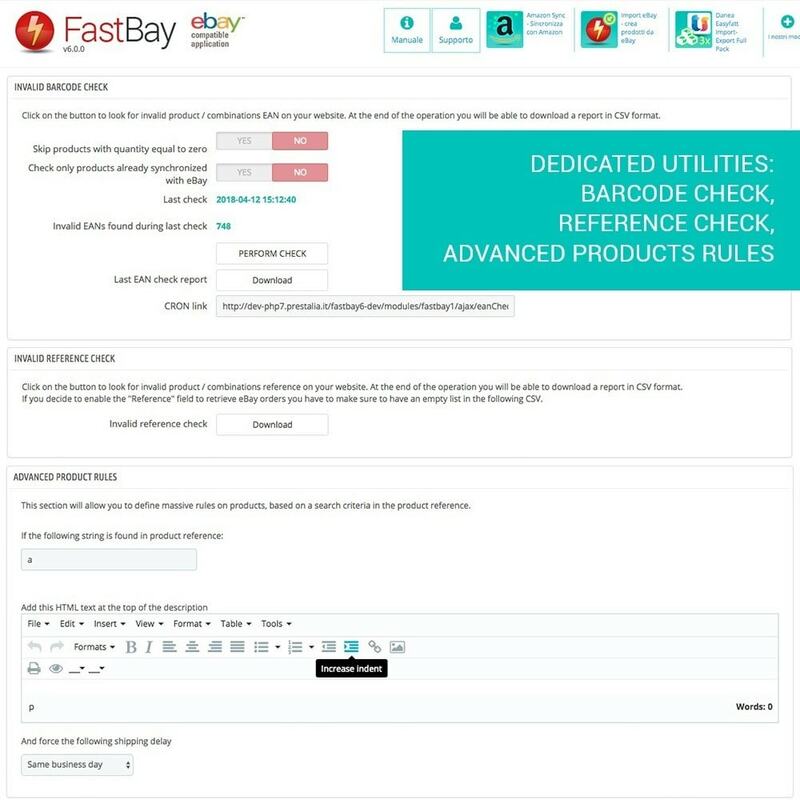 Complete product identifiers support - ebay 2016 rules (EAN, UPC, MPN, ISBN) with dynamic attributes, features, manufacturers, default ebay values mapping. 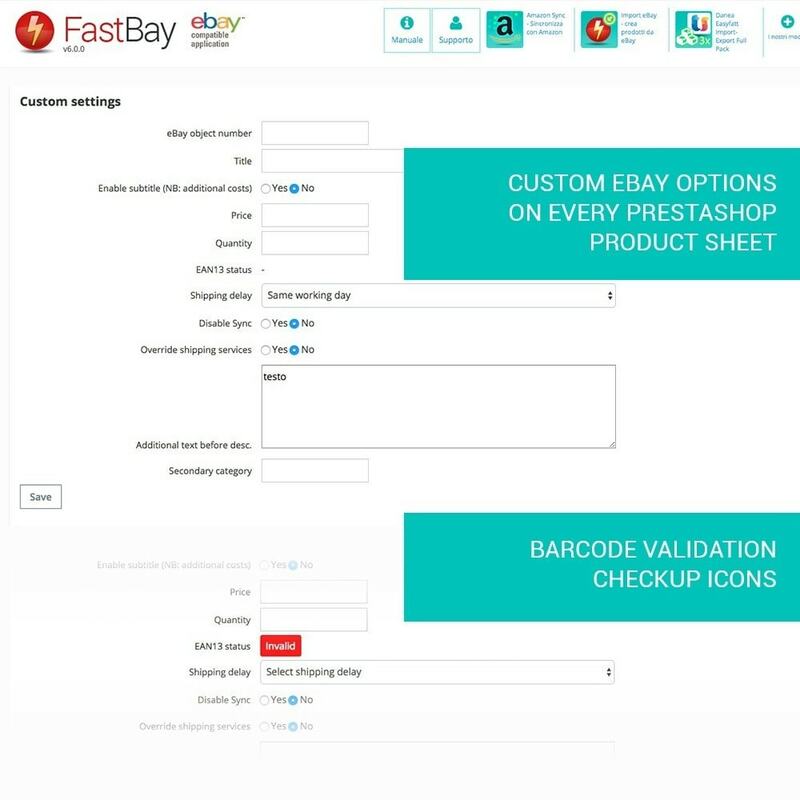 Notes: In order to import products from eBay to PrestaShop is available in the form "Import eBay - creates products from eBay listings"
Installation is straightfoward, you'll be ready in just a few minutes. In case of issues our customer care team is at your complete disposal to provide support and answer your questions.